How would you like to create the home of your dreams and not even have to worry about how much it costs? That's what the Home Design Story app lets you do on your iPod touch, iPad, and iPhone. This is a fun game where you will get to decorate, design, and add all the custom touches you want in your virtual home. You even get to decide the style of your home. Pretty much everything you can think of to add and customize in your home can be done in this app. It's great for anyone looking to have that dream home. Adults and kids alike will enjoy this app. In this game you get to be the designer from the style of the home, to the furnishings, and decor. It's all up to you. The app is free to download and play but there are a number of in-app purchases available, which are gems that can be used to purchase more items for your home. These gems start at $0.99 and go up to $49.99. Another thing to keep in mind with this game is that is does require an Internet connection to play as it is an active online game. This sometimes limits where you’ll be able to play it. With all that said this one is no doubt a whole lot of fun to play. Users are very pleased with the offering and I happen to agree with them. There are just so many customization features you can use and it allows you to get really creative while having fun. When you launch the game you will see there is a helpful guide that is there to walk you through the design process. It’s a help tool made to look like a person, which is a great feature. I do find the music a bit obnoxious but really that’s being picky. As you purchase design elements you will also unlock new ones leading you to more and more choices. You are also given tasks and as you complete them you are awarded coins that can be used to purchase more items. I find the gameplay very easy to understand and it's actually quite immersive because you find yourself wanting to purchase that one more item or do one more task. Some of the ways you'll be able to customize your home is with furniture in the style that reflects your personality, flooring, wall coverings, outdoor spaces, and more. You can hire a professional photographer to take pictures of your space, visit the neighbors to see their places and invite them to yours, and work on getting rich in the process. 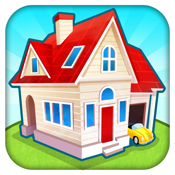 The Home Design Story app for your iPod touch, iPad, and iPhone is a fabulous game that allows you to design your own dream home. This game has fabulous graphics, great gameplay, and is incredibly addictive.